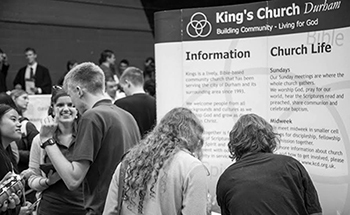 Kings is a lively Christian community worshipping at the heart of Durham City. We are committed to the preaching of Scripture, open to the work of the Holy Spirit and active in mission and service in the local community. Students from all sorts of church backgrounds (and none) are involved at Kings. We are a charismatic evangelical church, linked to the Ichthus Christian Fellowship in London and a member of the Evangelical Alliance. Whoever you are and wherever you are from you will find a warm welcome here. We have various activities specifically for students, including clusters and cells, Appleby cafe, student houseparty, Alpha and the June Project summer mission, but we encourage students to participate in all aspects of church life. Our main prayer for you as a new student is that you get stuck into one of the many local churches in Durham. We have written a letter of guidance on how to think through principles about finding a church. Pick a church and get stuck in, but be honest about where you’re at spiritually rather than pretending that you’ve got it sorted from day one. Use church as a place and community to teach you how to love those around you even when they’re very different from you. Here is a safe place to discover, have fun and find support in a busy university life. This is the obvious one but is by far the best way of seeing what Kings is like. We have two Sunday services during term-time and it’s worth checking them all out if you can but Morning Worship is top of the list! Look out for our stall at Freshers Fair on 2nd and 3rd October! There will be an opportunity to meet some of us, ask questions, find out more about the church, and sign up to the Freshers contact list. We will be having a student lunch at 1pm after Morning Worship on 7th and 14th October. This is an opportunity to meet some older students, more new students, eat free food and hear more about the church. On Tuesday 9th October we are putting an event on for new students to Kings. There will be a free hot meal along with a talk, and an introduction to what we do at Kings and how you can get involved. There will be student leaders, interns and staff there who you can talk to and get to know. It starts at 7pm and is in The Appleby Rooms. We look forward to seeing you there! Have a good look around the rest of the King’s website, particularly the Students section. Get in contact if you have questions or just want to say hi. 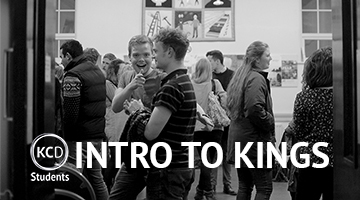 Email students@kcd.org.uk or find us on Student Linkup.